What are these maps telling us? 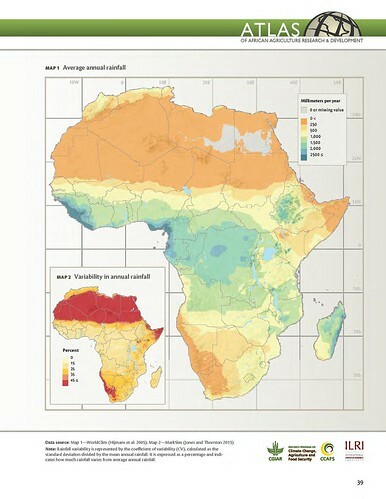 An average of less than 1,000 millimeters of rain falls per year across most of Africa (Map 1). Rainfall tends to decrease with distance from the equator and is negligible in the Sahara (north of about latitude 16°N), in eastern Somalia, and in the southwest of the continent in Namibia and South Africa. Rainfall is most abundant on the eastern seaboard of Madagascar; portions of the highlands in eastern Africa; large areas of the Congo Basin and central Africa; and parts of coastal western Africa including Liberia, Sierra Leone, and Guinea. Northern Africa experiences highly variable rainfall, except along the coasts of Algeria and Morocco (Map 2).This region’s coefficient of variation—a measure of how much rainfall varies from the annual average—is greater than 45 percent, reflecting the erratic nature of rainfall in a region that gets little precipitation. The story is similar in the extreme southwest of the continent and in pockets of the Horn of Africa. The amount of rainfall in parts of the Congo Basin is much less variable, with a coefficient of variation around 10–15 percent. For most of the continent where rainfed crops are prevalent, the variability is 15–35 percent. In Africa, where most agriculture is rainfed, crop growth is limited by water availability. Rainfall variability during a growing season generally translates into variability in crop production. While the seasonality of rainfall in the drier rangelands can play a significant role in productivity, rain-use efficiency (RUE)—the amount of biomass produced (in kilograms of dry matter per hectare) per millimeter of rainfall—also drives production. RUE averages about 3.0 kg of dry matter per hectare for every millimeter of rainfall in northern Africa, 2.7 in the Sahel, and 4.0 in eastern Africa, compared with up to 10.0 or so in temperate rangelands (Le Houérou, Bingham, and Sherbek 1988).